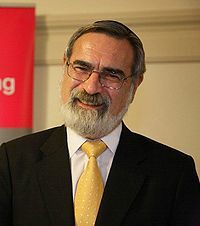 Chief Rabbi Lord Sacks has criticised people who try to avoid paying tax in the current economic climate. Addressing the annual dinner of the Jewish Assocation of Business Ethics in London on Tuesday night, he said: "I think individuals have to say 'if I belong in this society, I have to share in the fate of this society'. "Where everyone else is suffering, it is morally wrong to say 'I am going to take myself out of it'. Even if you can justify it, the fact is we're all in this together." We agree, of course, as did a bunch of protesters in London this week. Well said. But now here is a shocker, from the same story. When Mr Randall asked whether any of the 320 guests agreed with the Chief Rabbi's views on tax avoidance, only two raised their hands. And this was a business ethics meeting? What kind of business ethics are being discussed here? Any business that is seen to be taking wealth out of the country and not giving back to the community will find itself morally unacceptable. An interesting experiment, which probably has been done somewhere, might be for governments to publically acknowledgge (if they wanted to be acknowledged) the entities and persons who paid the most tax. Have a dinner for them at the president's house with lots of press coverage. Thank them.